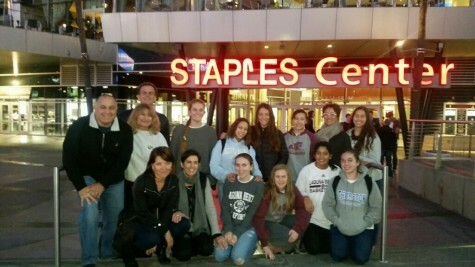 On Nov. 25, the Laguna Beach High School girls basketball team got the opportunity to play a local rival, Dana Hills High School, on the floor of the Staples Center, home of the Los Angeles Clippers, Los Angeles Lakers and Los Angeles Sparks. “Coaching at the Staples Center was an awesome experience. I sat right where Doc Rivers, head coach of the Clippers, sits. That was exciting,” said coach Mark Lewis. 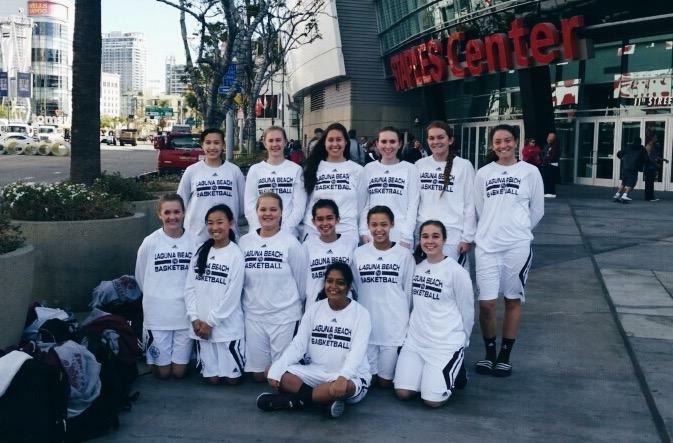 Playing at the Staples Center was a dream come true for the girls on the team. They were all thrilled to start the game. “It was such an amazing opportunity to play at the Staples Center; I know everyone was very excited about it! I think the best part was playing on the floor where so many great players have been; it was an irreplaceable experience,” said senior Alex Lewis. This unique opportunity gave the girls a little taste of what it feels like to be in the limelight. 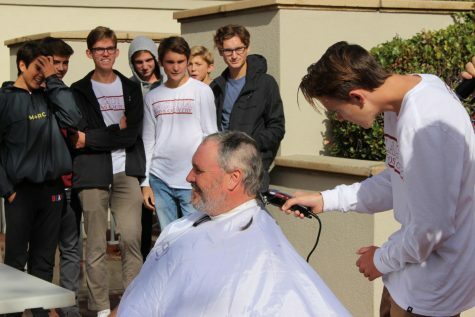 “It was a great day and a great event for all. There was good energy from the players, and it was a great way to start our season,” said coach Lewis. When the girls faced off against Dana Hills, the two teams were neck and neck for the duration of the game. As the last moment, Alex Lewis snagged a rebound and scored a two pointer, winning the game for the Breakers. “We won 39-38,” said coach Lewis. 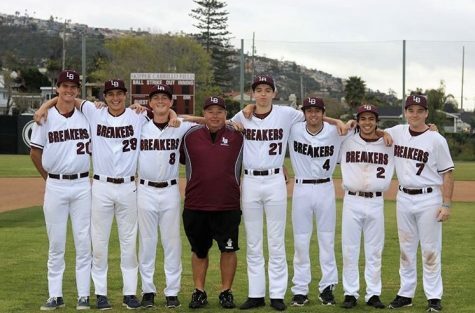 The LBHS players as well as the Dana players had fun playing against one another. They both maintained great sportsmanship throughout the competition because they knew it was a once in a lifetime experience to play on a professional court. “My favorite part of the experience was making a comeback in the last minutes of the game and winning it by 1 point. I also greatly enjoyed air-bailing a couple shots,” said senior Jackie Cenan. After the game at the Staples Center, the girls stayed in L.A. until later that night. Then they were allowed into the Center early to watch the Clippers warm up. They were also allowed to high-five them while the professional athletes ran through the arena at halftime. The girls kicked off their official season on Dec. 16. Both the girls and their coach are excited for this season. 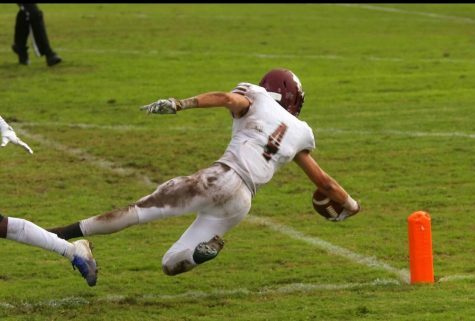 “I think our team is going to be unstoppable this year. We are connecting as a group, and we have some great competition to strengthen us as a team,” said senior Elise Pontius. Coach Lewis has great expectations for the the girls and can’t wait for them to win league and put a new banner up in the gym. “I am looking forward to our season and our team’s chances at putting together a really competitive campaign. We have started off the season 2-2, competing well in all games. We need to improve defensively and limit our turnovers by valuing each possession,” said coach Lewis. The girls will play two tournaments during break, one in Catalina and one in Hawaii. They are ecstatic to start those experiences. “I can’t wait to journey with my team to Hawaii. It is a once in a lifetime experience that I am so thankful for. I know we are going to have a great year and just get better with time. 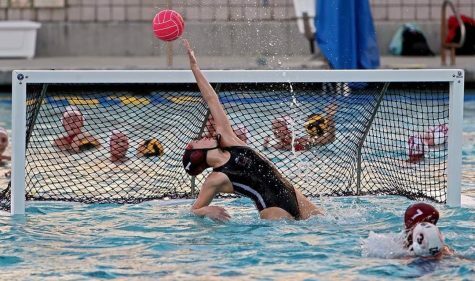 Where are hoping to succeed in our upcoming tournaments and put a few more wins under our belt before starting league games,” said junior Marissa Lee.